Over the past two weeks a storm has raged through the Arctic, churning and thinning the region’s thickest, most resilient sea ice. Now, almost all major measures show a dramatic thinning of the central ice even as warmer air has been funneling into the region. Models still show storm conditions continuing until June 17th. So the ongoing thinning and churning this storm has produced is likely to continue even as the region steadily warms. The storm that has now plagued the Arctic for two weeks has recently involved numerous low pressure areas. For this reason, it is appropriate to change its name, since multiple low pressure systems, rather than a single consistent cyclone, are involved. 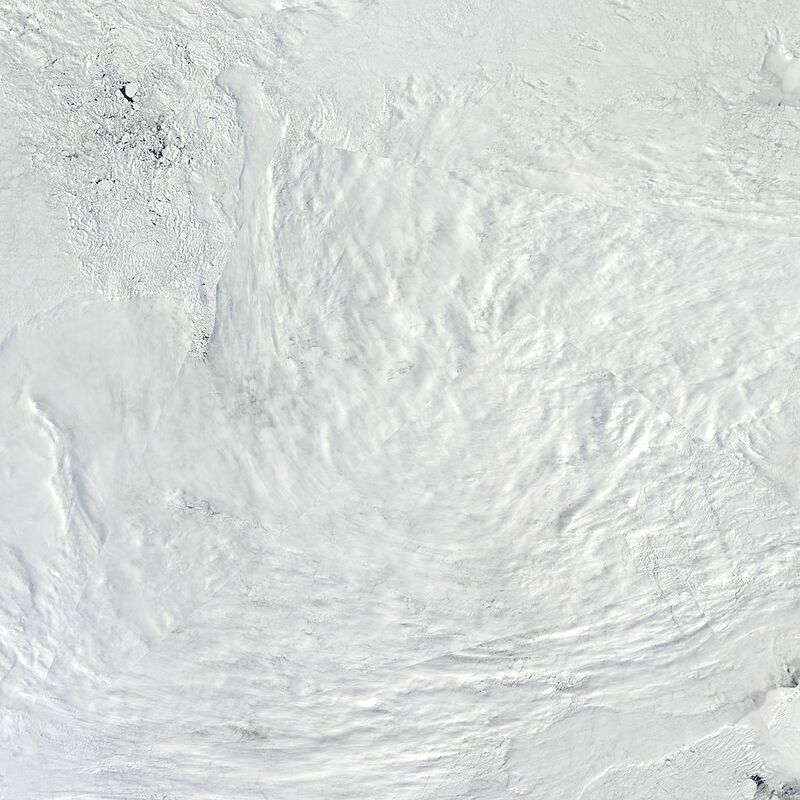 So, going forward, we will be calling this event: Persistent Arctic Storm 2013 (PAS 2013). Pressure levels are up somewhat, now showing about 995 mb in two low pressure centers flanking the North Pole. Forecast models show the storm remaining in the 985-995 strength range all the way out to June 17. These models have tended to show the storm hovering closer to Svalbard, the Kara and Laptev seas over this period as warmer air filters in and builds over the region of the Beaufort Sea and East Siberian Arctic Shelf. These models can be subject to quite a bit of change, so we’ll have to keep a close eye for any alterations. Tomorrow’s forecast is for the double-barrel low to recombine over the North Pole and drop to 985 millibars. It’s important to note that 985-995 is still a moderately strong storm. By comparison, Tropical Cyclone Andrea bottomed out at 997 millibars before dumping 10 inches of rain and sending 2-5 foot storm surges over portions of coastal Florida. So this particular storm, with a strength ranging from 975 to 995 millibars over much of its life contains a substantial amount of energy. It is also worth noting that quite a bit of warm air is lurking around the storm’s periphery. This air could boost the storm if conditions favor an influx of warm, moist air. It’s becoming more and more clear that this storm’s energy has gone to work in significantly eroding the Arctic’s central ice. Now, almost all sea ice monitors are showing dramatic impacts on sea ice in and around the Central Arctic Basin. The US Navy’s CICE/HYCOM thickness model now shows substantial thinning and divergence in two regions of the central, thick ice. The region closer to the Russian side of the Arctic has persisted for about a week now and is confirmed in the other measures below. The second region, closer to the Canadian Arctic Archipelago is newer. So we’ll have to look for persistence there. Overall, the remaining thick ice is in a much worse state in this monitor than it was last week. Uni-Bremen has also shown persistent and growing thinning in its surface ice concentration monitor. Now, many regions where the storm passed are showing surface concentrations of 75% or less. These features have continued to grow more prominent as ice in the Central Arctic thinned over the past week. In contrast to the US Navy’s CICE/HYCOM thickness model, this Uni-Bremen model measures surface concentration while CICE models thickness. Loss of surface concentration is the final result of thinning. But thinning tends to occur before losses in surface concentration are visible. Together, these measures provide growing evidence that the central Arctic sea ice has taken a substantial blow. As the central ice thinned and dispersed during this month’s Persistent Arctic Storm, sea ice area and extent also rapidly dropped off. Both Cryosphere Today and JAXA showed area and extent falling at rapid rates over the past week. Weekly extent declines for JAXA is in the range of 400,000 square kilometers, dropping back to 2012’s lower levels. 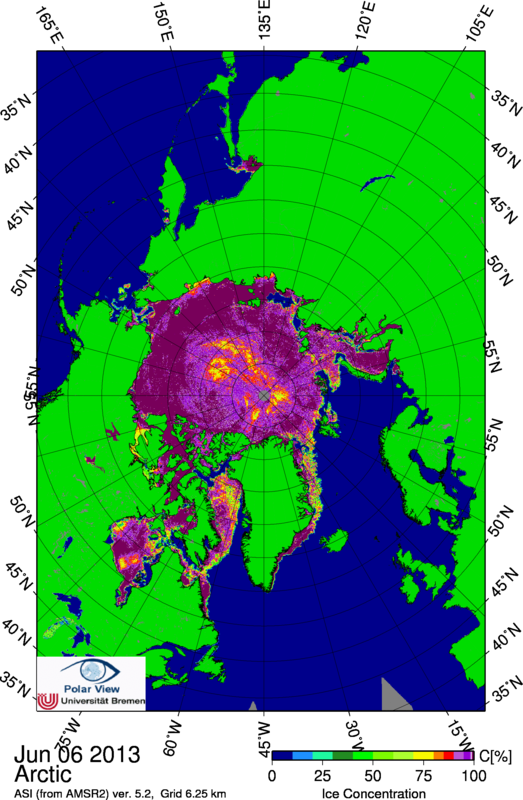 Cryosphere Today sea ice area losses were also rapid — in the range of 500,000 square kilometers. 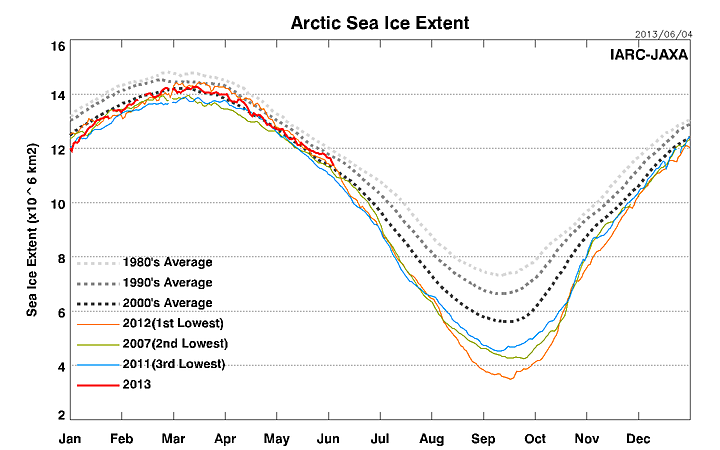 But sea ice area, according to Cryosphere Today, remained above 2012 levels. Some had asserted that this storm would result in ice formation, not loss. But visual, concentration, and thickness monitors show that just the opposite occurred. Furthermore, increasing (not slowing) pace of sea ice loss in both area and extent measures confirm the likelihood that this Arctic storm hastened sea ice erosion, melt, and volume loss during early June. Needless to say, this storm’s story isn’t finished yet. Note the swath above freezing temperatures hovering near the region of East Siberia. This area is a remnant of warm air pulled up from the Scandinavian heatwave earlier this week. It has now transitioned to its new location where models expect above-freezing temperatures to amplify over the coming days. Our storm still persists, centering now over Svalbard and the Kara Sea, while warm air is shown to engulf and invade the Arctic . So it appears that from all sides warmer air continues to encroach and get wrapped into this storm. 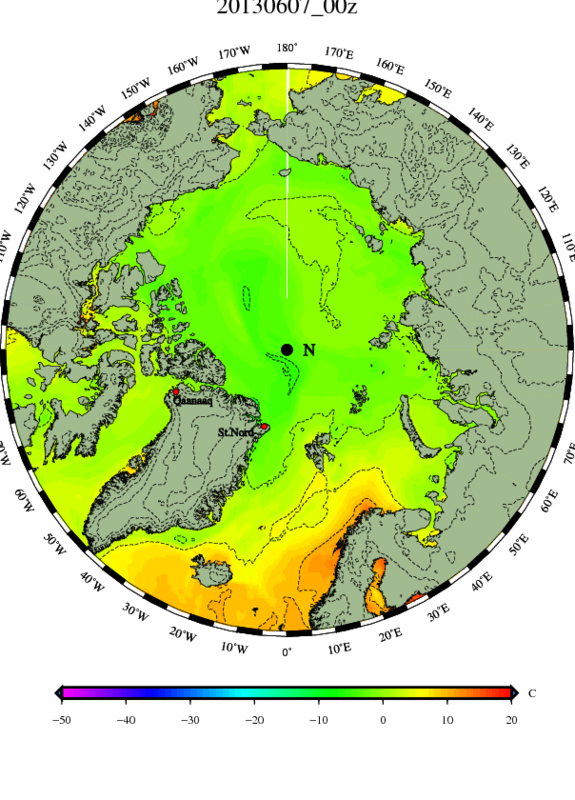 Such conditions are likely to further enhance rapid melt and thinning of the sea ice. Should these conditions, as projected in the ECMWF models, bear out, it is likely we will continue to see a melt acceleration over the next ten days. 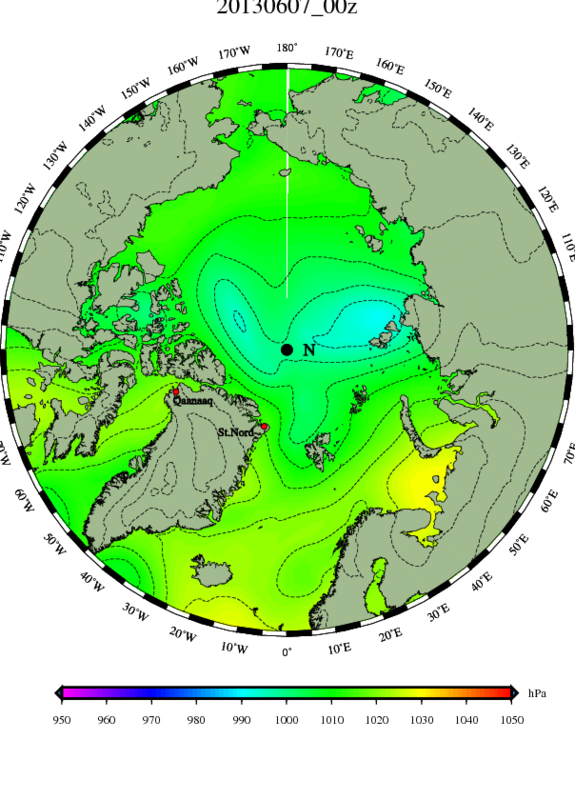 The higher temperatures, the action of the persistent storm in the central Arctic, and the already observed thinning of sea ice there are indications that melt may well already be on its way to a rapid ramp up. Conditions remain very dynamic and unstable with the likelihood of dramatic melt increasing as time moves forward.